If you’re in the market for a basic free VPN service or a paid service with fast and reliable performance, CyberGhost may be the VPN that you are searching for. CyberGhost is a paid service, but there is a free version available. You can use the free version of CyberGhost for as long as you want, with a few restrictions; it is not a one-time trial. 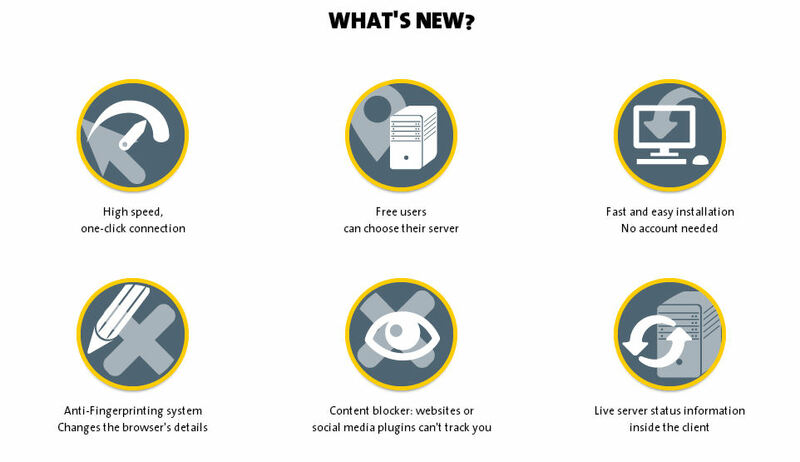 If you are happy with CyberGhost’s free services, you can choose to upgrade and get rid of the ads and disruptions. Becoming a paid subscriber also offers you access to more countries and servers. Note that servers are located mostly in the USA and Europe, so if you need servers in Asia or South America, you may need to look for a different VPN service. CyberGhost offers reliable, speedy service, though some customers report problems with support. For this reason, we cannot give them as strong a recommendation as we otherwise might, but they are worth considering if speedy, inexpensive service is important to you. • You want to surf the Internet anonymously and hide your IP address. The free VPN service works great for this; you can also use the free proxy service on the website if you do not want to download anything (currently this feature appears to be broken). • Unblock websites on your network or in your country. If you want to use Gmail, Twitter, or another blocked website, you can do so easily using CyberGhost. CyberGhost is also idea for unblocking media content on channels like Hulu, NBC, or the BBC. • Use torrents. Some VPN providers do not want you to use their services to access torrents, but CyberGhost actually encourages this. Installation of CyberGhost is fast and easy no matter what platform you are on, and you will find the program easy to use even if you are new to the world of VPNs. Even as a free user, you are allowed to choose the server you want. An anti-fingerprinting system disguises the details associated with your browser, and a content blocker prevents websites and plugins from tracking you across the web. With the wide variety of operating systems supported, you can use CyberGhost VPN on pretty much any device you can think of. CyberGhost will run on your Mac or PC, or on your Android, iPad, iPhone, or other mobile device. You can even run CyberGhost on your Chromebook. When you go to the download page, the Windows download will start automatically, which is slightly annoying, but all you have to do is click “cancel” and scroll to the bottom of the page to select the operating system of your choice. 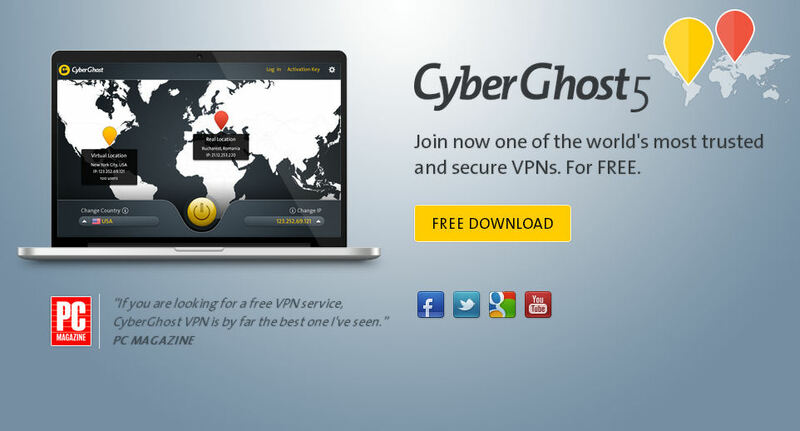 The free version of CyberGhost is available to anyone who installs CyberGhost VPN on their computer or mobile device and opens an account. There is no obligation to pay, and you can use CyberGhost for free for as long as you want. You are given unlimited bandwidth, AES 256-Bit encryption, and your choice of 22 servers in 14 countries (all in the USA and Europe). You can use the service on up to one device. The anti-fingerprinting system is included. There are a couple of restrictions. The first is that you will need to view an ad when you connect, which may run for 17 seconds or longer. Sometimes the free servers fill up, and you may need to wait in a queue to access one. Once you are connected, you will be shown another add every 120 minutes. Every three hours, you will be disconnected. You can reconnect again immediately, but you will need to deal with the ad again (and the queue, if the servers are booked again). This means CyberGhost will probably not be the best choice if you plan on a lot of long Internet browsing or streaming sessions. There are two tiers of premium paid service for CyberGhost: Premium and Premium Plus. Premium costs 20 Euros for 12 months. Premium Plus costs 49.99 Euros for 12 months. 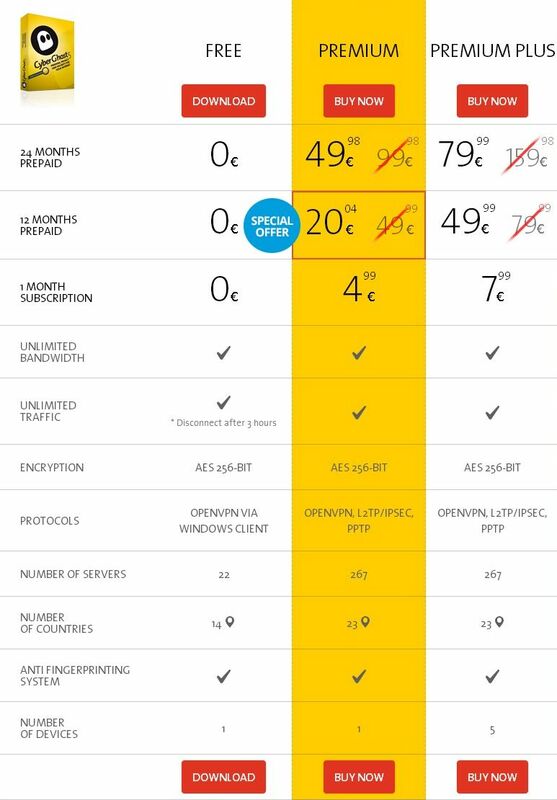 You can also purchase by the month if you prefer, but a single month costs 4.99 Euros or 7.99 Euros respectively, so the prepaid discount really is very nice, and this is arguably one of the cheapest VPN services you will find if you choose to buy 12 months in advance. Both Premium and Premium Plus include unlimited bandwidth and unlimited traffic, and no more ads or disconnects. They feature the same AES 256-bit encryption and anti-fingerprinting system. With either tier of service, you can choose from 267 servers located in 23 different countries—including Singapore (but most of the servers are still in Europe). Whereas the free version of CyberGhost only supports OpenVPN via Windows, the paid tiers support OpenVPN, L2TP/IPSEC, and PPTP. You would only use Premium Plus if you want to add more devices (up to 5). If you pay for CyberGhost and change your mind before the serial is activated, you can request a refund. After your account is activated however and you begin receiving paid services, refunds will only be considered on a case-by-case basis. There is no official information on how many IP addresses are available when you use CyberGhost VPN, but since the company has 267 servers, a large number of IP addresses are included. The free service is a bit limited in that regard, which is why there is sometimes a queue. The IP addresses are located mostly in Europe and the United States, so if you specifically need an IP address in another part of the world (like South America or Asia), you will want to look into another service which is less Euro-centric. There is no bandwidth limitation on any of the packages, including the free package. CyberGhost is very easy to use with a world map and two dropdown menus which allow you to select a server in a country of your choice. You can also allow the program to assign you a server automatically if you are not particular. When you are connected, the interface will clearly show your simulated location and connection status. Few users report any issues with stability or any significant lag. Disconnects of course are built in if you are on the free version, but they are nonexistent if you pay for the Premium package. Users did not report any disconnects with the Premium or Premium Plus versions of CyberGhost. Speed is surprisingly good with CyberGhost, even the free version. Users of this service consistently report improvements to their download and upload speeds, consistent with the quality one would expect from paid services only. This is an outstanding consideration in favor of CyberGhost. CyberGhost is great if you want to browse the Internet anonymously and know that your data is secure. The fact that they actually provide specific information on their encryption is excellent, and so is their extra feature of anti-fingerprinting for browsers. Additionally, CyberGhost states on their website that they do not retain logs of client activities. Most VPN services do (even if just for a week), so the fact that CyberGhost maintains no logs at all may be appealing if privacy is a special concern for you. CyberGhost provides an online help manual and FAQ. If you cannot find answers to your questions there, you may find them on the discussion board. Beyond those resources, you can contact customer service directly via email or live chat. This is one area where CyberGhost may not excel; browsing customer reviews, we found that those reviews were mixed when it came to customer support. Some reviewers had a great experience with the CyberGhost support team, while others were unable to get help. Some users also reported that the service stopped working after a few days (on both the free and premium versions), and that they were unable to resolve the problem. That is a major drawback and a cause for concern. As per our experinece, we have had to wait almost two days for our ticket to get answered, which is below average customer service, certainly. There are a lot of reasons to consider signing up for an account with CyberGhost. The free service may be all you need if you are looking for something for occasional use, or you do not mind occasional ads and interruptions. The free service appears to be much faster than the average free VPN. The paid service gives you access to more servers, but still mainly located in Europe. Despite all these positives, you may want to hold off on a paid package until you contact customer service and test them out with a few questions. Since the customer support team has received mixed reviews from users online, it would be wise to talk to them first and make up your own mind about whether you want to trust CyberGhost with your money.